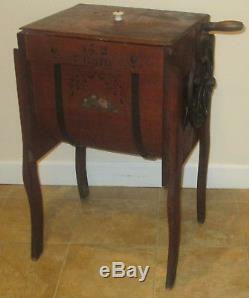 ANTIQUE WOOD 7 GAL EASY RUN BENTWOOD STENCILED BUTTER CHURN NOTE: MAKES A GREAT SIDE/END TABLE. JUST REMOVE THE WHITE KNOB ON THE LID FOR A NICE FLAT SURFACE. 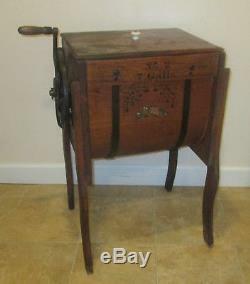 This is a magnificent example of all original Antique Advertising Butter Churn. 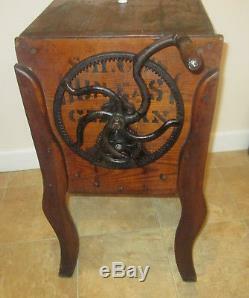 It is made of wood and has a heavy-duty cast iron turning gear and crank on one side. There are two thick metal straps that run under the bentwood belly of the churn. 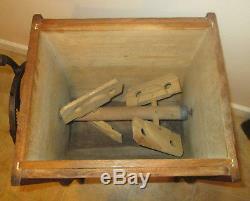 Churn measures : 16 1/2" deep x 20" wide, x 29 1/2 high. Width measurement does not include the 5 handle that protrudes on the turn crank. One side of the churn is stenciled : S. The other side: Simmons Hardware Co. The front of churn is stenciled: N0. There are floral decals on both sides. 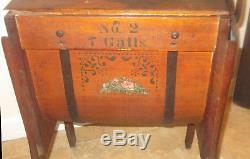 Piece is in excellent all original condition with wear consistent to its age and use. THE PHOTOS PROVIDED ARE TO BE USED AS PART OF THE DESCRIPTION. They are to be considered vintage or used, unless otherwise noted. ONLY items grossly misrepresented are returnable. 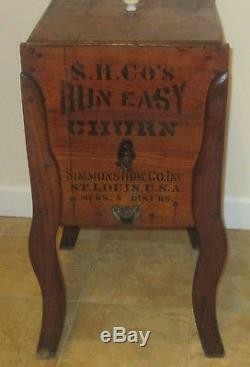 The item "Antique Primitive 7 Gal No 2 RUN EASY Bent Wood Advertising Butter Churn SIMMONS" is in sale since Thursday, November 09, 2017. This item is in the category "Collectibles\Kitchen & Home\Kitchenware\Butter Churns". 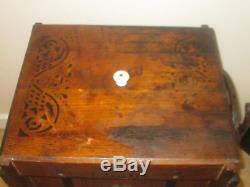 The seller is "argyleavenueantiques" and is located in Milwaukee, Wisconsin. This item can't be shipped, the buyer must pick up the item.